This ultra-sharp kitchen knife is made by bonding an amorphous metal alloy edge to a high quality stainless steel knife body. Finish it off with a military-grade tough handle, and you’ve got an exceptionally durable knife that is guaranteed to last a lifetime. Dimensions: 15.25" x 3.125" x 1.25"
This is very sharp. I can cut anything with ease. Knife very sharp but blade is too large to use as a paring knife. 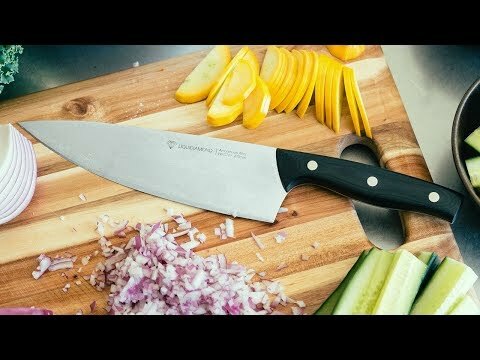 How do you build a better kitchen knife? Start with the edge. Liquidiamond kitchen knives combine an amorphous metal alloy edge with a high-quality stainless-steel knife body. The result is a strong, ultra-sharp knife that’s guaranteed to last a lifetime. Amorphous metal alloy is an extremely durable material that can handle high temperatures—which is why NASA uses it on its space crafts. Besides handling the perils of outer space, this material makes a knife edge that is tougher and less likely to chip than the typical ones. And if your blade does get dull with use over time, Liquidiamond happily provides on-the-house sharpening. The next-level knives are completed with a sturdy handle made from military-grade fiberglass-impregnated epoxy resin. 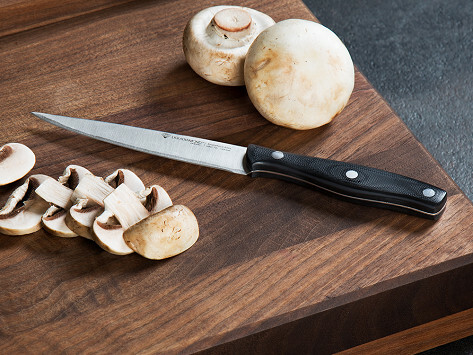 With all this tough (and sharp) durability, it’s no wonder the knives are guaranteed to last.